Four additional bouts today were announced for the Dec. 31 DREAM “Dynamite!! 2010” event. DREAM Super Hulk tourney winner Ikuhisa “Minowaman” Minowa (47-31-8 MMA, 7-4 DREAM) meets Sengoku fighter Hiroshi Izumi (3-1 MMA, 1-0 DREAM), and featherweight Hideo Tokoro (26-23-1 MMA, 4-6 DREAM) meets former boxer and K-1 vet Kazuhisa Watanabe (0-0 MMA, 0-0 DREAM). 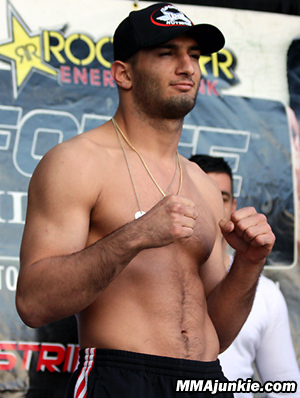 Additionally, notable HyeFighter Gegard Mousasi (4-0 kickboxing) takes on Kyotaro Fujimoto (18-4 kickboxing) in a K-1 rules bout. The organization also confirmed a Jason High (10-3 MMA, 2-1 DREAM) vs. Hayato Sakurai (35-11-2 MMA, 4-3 DREAM) welterweight bout. DREAM “Dynamite!! 2010” takes place at the Saitama Super Arena in Saitama, Japan, and airs on HDNet in the U.S.
Strikeforce heavyweight champion Alistair Overeem also is expected to be a part of the card, though the organization still is trying to finalize an opponent. Officials confirmed former WWE star and Strikeforce vet Bobby Lashley is a possibility. A source close to the fighter told MMAjunkie.com on Thursday the bout has a solid shot of being signed.